Hello stampers! The February issue of the Technique Junkie Newsletter was mailed today and I think it's time to show you some new things! I have always loved black and white photos that have slight amounts of tinting. 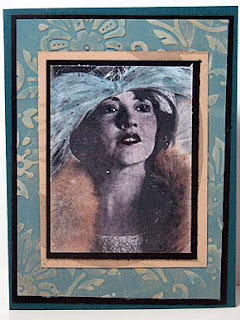 I love my photo stamps, so I was inspired to create this Distress Photo Tinting Technique in the February issue. The stamp used here is from Stampsmith -- the leader in photo-style stamps, in my opinion! Junkies, you can access the Newsletter now...if you need a password, please email me and I will answer you as soon as I can. Enjoy the issue! If you are not a Junkie, now is a great time to join. You can subscribe to the online version for all of 2012 for only $9.99. You will have access to 90 tutorials at the end of the year. A bargain, right? In any case, I hope you enjoy the techniques in this issue. Can I interest you in coffee and the paper this morning? This little card uses two techniques from the new Stampin' Companion CD: 70 Tutorials exclusively using SU products (order HERE). Many of you have been getting them in the mail over the weekend and the rest who ordered so far will get them early this week! The three techniques I used were the Zagged Newsprint, Watercolor Pencils and Wisped Framelits Techniques. I love way my sweet little card turned out! Hope your coffee is strong and your news is good -- have a great day! 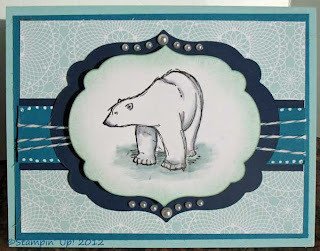 All Stamps and Materials: Stampin' Up! Welcome to the last stop on the Technique Junkie Newsletter mini blog hop celebrating the release of the Stampin' Companion CD! I hope you have enjoyed the hop so far. If this is your first stop, I suggest starting at the Design Team blog (http://techniquejunkies.blogspot.com) so you don't miss anything. My project today is an example of the Notes Corkboard Tutorial from the CD. 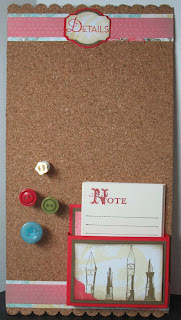 I love this sweet little memo board! With the note cards attached right to the board and decorated push-pins, it is a great item to hang in the kitchen or office. And it takes just minutes to make, too. The Stampin' Companion CD contains 70 tutorials that exclusively use Stampin' Up! products. The CD is only $17.95 to US/Canadian addresses, or $19.95 for overseas addresses. The first wave of CDs are being mailed today. If you haven't ordered yours yet, you can order it directly from my blog, or from the Stampin' Companion webpage. Thank you for coming to the hop -- I hope you enjoyed our preview! This Vintage Collage card is an example of one of the 70 tutorials from the new Stampin' Companion CD (70 tutorials exclusively using Stampin' Up! products). I love the aged, Chic look of this technique. I just hear from my printer, too -- the CDs will be here tomorrow, so if you have not yet ordered yours, do it today so you receive yours with the first of the CDs mailed! You can see a full list of the tutorials and order your CD HERE. 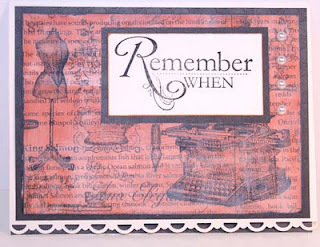 One of the easy tutorials on the CD is how to blend Stampin' Write Markers to get a watercolored, or a more subtle, look. On the example below, I wanted to create shadows and contrast to a "white" image; using the markers by themselves would have resulted in hard lines -- not the soft blended look that I wanted to achieve. I used the Blended Marker Technique (FREE tutorial below the image) to create the look I wanted. (Note: If you cannot get the link to work, copy and paste it into your browser). To order this awesome CD, go to the Stampin' Companion Page, order from my blog directly, or order from the Technique Junkie Newsletter home page. A list of the 70 tutorials is also on the Stampin' Companion page. If you are a demo, this CD is wonderful for workshop ideas. If you are just a fan, like me, you will love knowing what to do with all of your wonderful Stampin' Up! products! *The Technique Junkie Newsletter, and the products and services it provides, are not affliated or endorsed by the Stampin' Up! Corporation. Stampin' Companion - 70 tutorials exclusively using Stampin' Up! products. 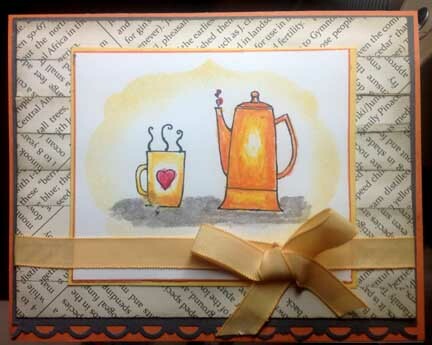 This CD has a terrific blend of cards, projects, and other ideas. Every tutorial uses current Stampin' Up! * products, including items from the current mini catalog and Sale-a-Bration. The CD is a collaboration between Pat Huntoon and Jane Bosi and uses all of the products -- including the dies, sizzlits/framelits, smooch paints, inks, stamps, paper, etc., from the current Stampin' Up! catalogs. If you are a demonstrator, this CD will provide you with workshop ideas for many months to come....and if you are just a fan (like me), you will enjoy using your SU Products with these tutorials. The Technique Junkie Newsletter and the products and services it providess, are not affiliated nor endorsed by the Stampin' Up! Corporation.